I promised myself I’d do three Twinchies each month and share them with you. This block, Independence, is my newest Twinchy. It’s based on a block in the book 101 Nine Patch Blocks. I had a small scrap of Buttercream canvas (which has been discontinued) and I wanted to use threads which would showcase this color. So I picked a shade of Watercolours, Autumn Frost, which I think of as “pastel Tahiti.” Then added the apricot and dark blue threads. Because the color of the canvas is so striking, I wanted to have it be one of the patches. 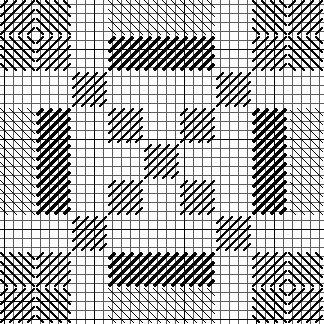 You could easily stitch this in four colors instead of three or even use five and make the Nine Patch block in the center a real focal point. The chart is below, enjoy! This looks great! Buttercream canvas really shows the colors well. That’s lovely Janet! But I have a question. What diagraming software do you use to create those diagrams? I use a program called Stitch Painter from Cochenille software. Then for longer stitches I go and put in the connections in an ancient (circa 1996) copy of Photoshop. These days Photoshop Elements would probably do it just as well.